“You give me these five baits and I’ll be able to catch fish throughout the year,” says Dance. The five favorite baits that help America’s favorite angler catch fish every time. Most dedicated Texas bass anglers have one or two lures that they prefer fishing. Some of use enjoy fishing spinnerbaits, and others primarily fish worms. If you had the opportunity to look through Bill Dance’s Plano tackle box, you would likely find it overloaded with five of his favorite baits: the spinnerbait, crankbait, worm, jig and Pork-O. 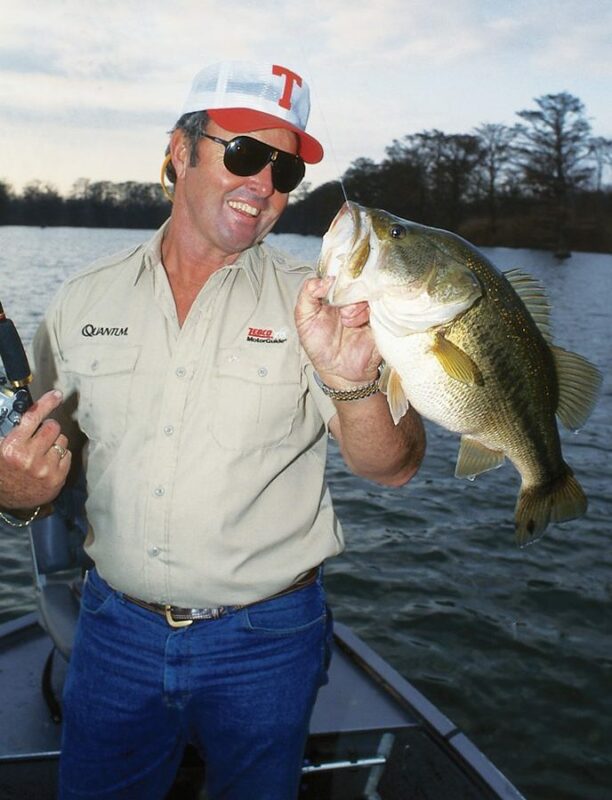 Bill Dance, America’s favorite fishermen, uses these five bass lures to catch fish from Texas to Florida and throughout the Southeast. He has agreed to share a few tips with Texas Fish & Game readers. Everybody loves to fish spinnerbaits, and Dance does, too. His preferred bait is a Strike King Spin Dance. Many of you might think Dance likes this bait just because his name is on it. But the real reason he enjoys fishing this particular bait is because it really catches the fish! Fishing spinnerbaits effectively near stumps, logs or brush piles setting in 1- to 5-feet of water isn’t hard to accomplish. Since spinnerbaits are the number one lure purchased by fishermen across the United States, most anglers can competently fish them when bass are shallow. But what many anglers overlook is their effectiveness in deep water. The 1- to 5-foot range is an ideal depth to fish spinnerbaits during the spring and fall, but Dance also fishes spinnerbaits at much deeper depths during the summer and winter months. Defining deep, however, is a little tricky because what one angler might consider deep, another angler’s reference to deep is totally different. Whenever the conditions dictate fishing at depths in the 20-foot range, Dance will rely on a spinnerbait. A jigging spoon is another good lure when fishing deep, however, spinnerbaits have more fish-catching qualities. You can fish spinnerbaits slower, they are more appealing, offer more action, and you can fish them through the strike zone longer. Spinnerbaits also move slower which gives the bass more time to look it over before striking, says Dance. When fishing spinnerbaits for deep-water bass Dance primarily throws a 3/8 ounce bait with a single blade. He also rigs the bait with a Bo-Hawg Pigtail pork trailer. Boat position is critical when using Dance’s deepwater tactic. He recommends positioning the boat in shallow water (if the terrain permits) and casting out toward deeper water. Rather than setting over deep water and casting to the shallow ledge, for example, move your boat over the shallow water and cast out toward the deep gut of the creek channel. This allows anglers to slow-roll the spinnerbait from deep to shallow water. Anglers who dedicate themselves to fishing spinnerbaits at depths which most anglers seldom cast will be highly rewarded with big catches. “It’s a proven tactic,” Dance states. Bill’s five favorite lures include: a Strike King spinner bait rigged with a Bo-Hawg Pigtail pork trailer (1st); the Jig & Pork (2nd); Bomber Fat A crank bait (3rd); the Pork-O (4th); and the Air Worm (5th). When it comes to locating bass, Dance always throws a crankbait. Not only do crankbaits help him locate bass, they are also an ideal bait to fish from shallow to deep water. Additionally, crankbaits are effective 12 months out of the year. Dance’s Autograph Series Bomber Fat A crankbaits are equipped with special Excalibur hooks and two colors which he personally designed – the Shad Ghost and Bengal Tiger. Many fishermen believe that the faster you retrieve a crankbait, the deeper it will dive. This is a complete misconception, though. Water pressure must flow off both sides of the crankbait lip equally in order for the lure to dive properly. When anglers use too fast of a retrieve, the water pressure begins to flow off the front portion of the lip which creates a “wet stick” affect. This not only restricts the depth, but the action is also effected. Retrieval speed is important to control depth, and the size of your fishing line is also significant. Anglers can get an average crankbait to dive an extra two feet by using a small diameter fishing line. But there’s a point when you can use too light of a line and lose depth. Dance primarily uses 10-pound test Stren when fishing crankbaits. Anglers who opt to use 20-pound monofilament line, for example, may possibly alter the lure’s action and vibration qualities. This particular bait is a long, slender piece of pork fat especially cut to emulate baitfish. There are two sizes available: the 7-1/4 inch Pork-O, and a smaller 5-1/4 inch size. Depending on his retrieve, Dance will fish a Pork-O to simulate a dying baitfish, or an active shad trying to escape its predator. No matter what presentation he uses, the Pork-O is top contender on Dance’s favorite fishing lure list. Dance likes the Pork-O because it catches fish, naturally. But he also enjoys this bait because it can be fished with so many presentations in shallows and down deep. The key to fishing this bait with success is to force yourself not to overwork it. Anglers can easily use too much wrist and rod tip action when fishing the Pork-O which spoils the natural action. There probably isn’t a bass fishermen in Texas who hasn’t missed a strike while fishing a topwater bait. When a big bass busts the surface trying to engulf the topwater plug, the first reaction is to set the hook. This premature reaction normally pulls the lure out of the fish’s mouth. Anglers who get too eager to set the hook when fishing the Pork-O will experience the same misfortune. Dance cautioned readers, however, not to give the fish too much slack once it strikes the Pork-O. “Bass think it’s the real thing, and they’ll swallow it if you wait too long to set the hook,” says Dance. “It’s easier to maintain close contact with the bottom when fishing deep to shallow water,” says Dance. It’s safe to say that more bass have been caught while fishing a plastic worm than any other bait available. Needless to say, the plastic worm is another lure among Dance’s five favorite bass baits. He enjoys fishing this lure simply because it’s an easy bait to fish. They work great through just about any type of cover and they can be fished at nearly any depth. Additionally, they are one of the bass’s favorite lures! Most of the time Dance will fish a Riverside Air Worm rigged Texas-style. However, when the conditions dictate, he will also use it as a weedless topwater bait, or rigged South Carolina style. No matter what rigging method he chooses, it’s an old stand-by that always catches a few. Anglers should keep in mind that worms are an eye-contact bait and work best when fished in a clear water environment. Worms are a good bait in stained water, but only when fished in the shallows. If the water is super clear, you can fish them as deep as needed, says Dance. When working worms around brush piles, for example, Dance uses a slow-hop presentation. As the worm falls back to the bottom, the tail action vibrates the worm body. This feature allows Dance to fish the bait with confidence. When bass are inactive Dance chooses a 3/16-ounce sinker rigged Texas style. This particular weight size allows the worm to fall slower and appear more natural. Appearance is very important when bass are in an off-feed period, during the summer months for example. Every school teacher has a “pet” student, and most fishermen have a “pet” lure. If Dance was a teacher, he would pick the Bootlegger Ratlin’ jig tipped with a chunk of Bo-Hawg pork as his personal “pet.” Although Dance truly enjoys fishing the jig and pork combination, he will only use this bait when the conditions permit. No matter what type of conditions Dance faces, however, he will always fish the lightest jig possible. The reason is simple: lighter jigs can be fished slowly through cover, and the fall rate is much slower. Additionally, a lighter jig and pork combination simply looks more natural. Sure, anglers can throw a heavy jig farther and they get to the bottom quicker. You can also feel a heavy jig much better. You will not experience, however, the same success with a jig that is too heavy. This is especially true when fishing in cold water or when bass are in a negative mood and very lethargic. Some fishermen have trouble detecting strikes when jig fishing. This is a bait that requires the angler to concentrate on what the bait is doing as it works through, around and over cover. Jig fishermen should also get in the habit of watching their fishing line. When casting a jig, there are two very effective presentations that Dance uses. One is a bottom-hopping method and the second is a “swimming” technique. When Dance uses the bottom-hopping method, he casts the lure out past the target and allows the jig to fall while maintaining a semi-tight line. Once the jig settles to the bottom, he will raise the rod tip slowly from the 10 o’clock to the 11 o’clock position. As he moves the rod tip up, the jig will swim forward. Once the jig settles back on the bottom, he lowers the rod tip and reels in the slack line. When using this technique, anglers should be aware that most strikes will occur while the jig is falling. The “swimming” technique is very different. Here, the jig and pork should swim parallel to the bottom while maintaining tension on the line. Use a slow retrieve while watching your line because the strikes are detected by a slight twitch or lateral movement of the line. Dance’s yo-yo technique presents the jig through the strike zone longer and will often trigger the most reluctant bass into striking. If you are not an avid jig fishermen, give them a try because they are a very effective bass lure during all four seasons. These tips won’t guarantee success, but they do tip the odds in your favor.